This year at Rolex there was not a lot of real “newness” within the Rolex Professional collection. In fact, there are only three new models, and they’re updates to existing watches in the lineup, as opposed to brand new designs. Although there is an all-new movement that powers two of them, and the R&D that goes in to even minute upgrades is surely significant at the world’s number mechanical watchmaker. Below is a quick breakdown of the three new Rolex Professionals, which debuted at Baselworld 2019. First, the Black and Blue Ceramic Bezel GMT-Master II has been given the same treatment as the stainless steel Pepsi Bezel GMT-Master II got last year, such as the addition of the Jubilee bracelet (Ref. 126710BLNR), now the only option on steel GMT-Master IIs (the Oyster bracelet has been discontinued for all steel GMTs). And Rolex also gave the “Batman” the same caliber 3285 movement, originally introduced last year, that powers the “Pepsi” GMT-Master II. They’ve also smoothed the edges of the case and lugs to make the watch a bit more ergonomic, just like they did with the Pepsi last year. Second, is the Yacht-Master 42, which comes in a new larger 42 mm diameter case, that’s now only available in 18K white gold (although more versions will likely be added later), and it’s powered by the all-new caliber 3235. The Yacht-Master 42 (Ref. 226659) is fitted with a black Oysterflex bracelet, which combines the comfort of a rubber strap with the robustness of a bracelet. In addition to the increased size, new movement, and rubber strap, the new Yacht-Master 42 also has a new color scheme with all white printing on the black dial, and all-black embossed and polished markings on a matte black ceramic bezel, which certainly gives the watch or more sporty and understated look. 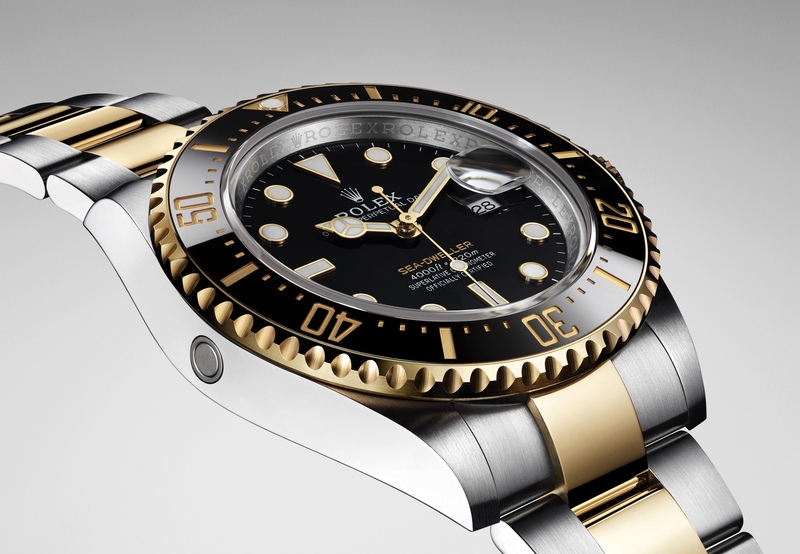 Last, is the Sea-Dweller Yellow Rolesor which is also powered by the all-new caliber 3235. In 2017, Rolex updated the Sea-Dweller for its 50th Anniversary, and this watch is much the same, just with new materials. The case measures 43 mm in diameter (Ref. 126603) and water-resistance is 1,220 meters. What’s new is the two-tone accents. The hands and hour markers are in 18K yellow gold, “Sea-Dweller” is stamped in gilt print on the dial, and the bezel, crown and Oyster bracelet center links are solid 18K yellow gold.